By the end, the games run together for teams playing in the Deep South Classic, or at least most of the games for most of the teams do. 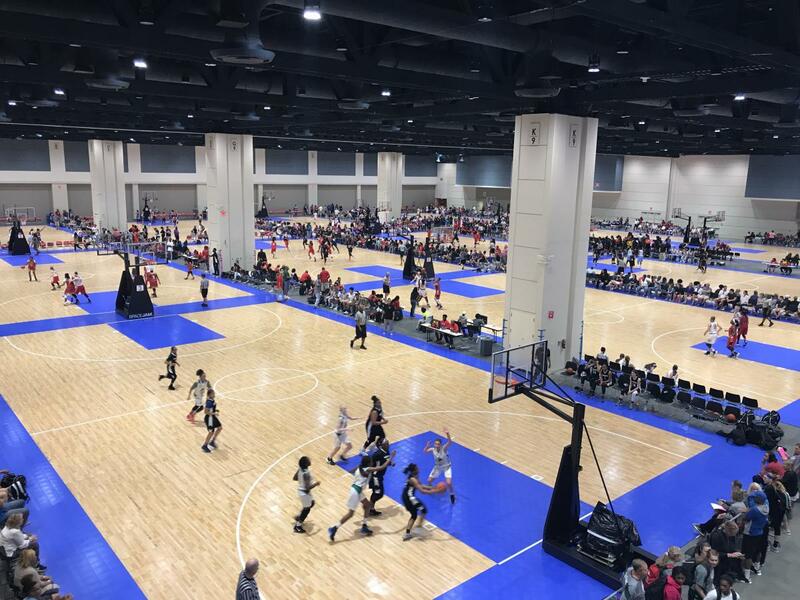 From Thursday to Sunday, it&apos;s wall-to-wall basketball at the Raleigh Convention Center (RCC). By the time the players, coaches and parents start to turn their focus to the trip home, the details get fuzzy: Was that big comeback Fri. night or Sat. afternoon, and was the opponent from Maryland or Michigan? More than 400 teams—from Canada and as far away as Nevada and Arizona—come to this event, in its 19th year overall and fifth time at the convention center. The appeal is basketball, and the chance to play with college coaches sitting courtside. Nearly 500 of them show up to watch teams and players perform. But it&apos;s the moments on and off the court that stick with the teams after they&apos;ve taken their last shots and dribbles on one of 20 temporary courts in the convention center&apos;s 150,000-square-foot exhibit hall. It was the team from Miami, the Lady Jaguars of South Fla., getting a chance to go horseback riding in Wake County before their game Fri. afternoon. The Jaguars, playing in the 15-and-under division, went 2-2, and Coach D.J. Perez said his team definitely would return. He also said he didn&apos;t care as much about the wins and losses as he did about giving his players a chance to grow and bond with each other. It was Transway, the team from Hamilton, Ontario, not only getting to visit the campuses of Duke and UNC but also trying out the restaurants that two of their parents, who happen to be chefs, scouted in a way that only chefs can. They chose H Street Kitchen and The Pit, with many trying hush puppies for the first time. Barbecue in general and The Pit specifically were popular among the visitors, especially those staying at downtown hotels, such as the Raleigh Marriott City Center, which connects to the convention center by escalators under Salisbury St. In all, about 65 hotels were used to house 12,000 visitors, including more than 4,000 athletes. Scott Hazelton, who played collegiately for Connecticut and Rhode Island in the early 2000s, coached the Mass Rivals&apos; under-14 and under-15 teams to a combined 9-0 tournament record. He said that the organization has been attending Deep South for the past seven years. "It was a phenomenal experience for our club," he said. "So many talented teams, which allowed for great competition. Also just about every college in the country was represented, so it&apos;s great exposure." The coaches are everywhere, especially the final days of the tournament. At the far southeast corner of the convention center on Sun., coaches from Boston University and Bowdoin watch a game on Court 20 between teams from Maine and Fla. Mid-afternoon on Court 4, the seats reserved for coaches are filled with recognizable faces, among them national champion coaches Brenda Frese of Maryland and Dawn Staley of South Carolina. Staley in particular creates a stir. At five-foot-five, she&apos;s relatable to so many of the players. Plus, she just became the first coach not named Geno Auriemma to win the NCAA title in five years. 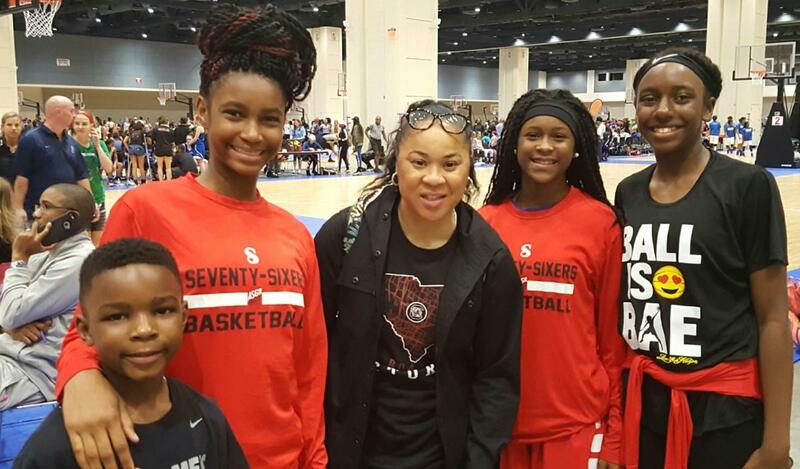 Teenagers from S.C. and other states want pictures with Staley, who has a job to do but nonetheless stops while players and parents aim and fire with their smartphones. For some people, the event was a chance to come back home. Todd Steelman, now the women&apos;s coach at Presbyterian College, recognizes the referees that used to call his games back in the 1990s, when he was the coach at Durham&apos;s Cresset Christian Academy. Mark Simons, an assistant at Michigan State, gets to reconnect with his daughter, who lives in North Raleigh. Simons, formerly the men&apos;s head coach at Elon, said having the games at one location make it far easier to efficiently scout players. That wasn&apos;t how the tournament initially was run, but changes over the years have ended up being beneficial for the event, according to tournament director Larry McKay. "The advantage of a multicourt facility in one building is it&apos;s one-stop shopping," McKay said. "For the coaches recruiting, they can move from court to court based on the schedule. The teams get exposure, and it helps us as far as staffing." Previously, the tournament was held mainly on courts at North Carolina State University, Duke and UNC. But NCAA rule changes took such events off college campuses. Deep South organizers for one year held the tournament at high schools and recreation centers in the Triangle, a struggle logistically. In 2013, the event found its home at the RCC. The RCC already had hosted sporting events, but not multicourt basketball ones. The first year of any big event is hard, McKay said, because you can&apos;t plan for everything. "The first year that we did this, the first games were at eight o&apos;clock Fri. morning," McKay said. "They were still putting tape down at 7:55am. We started some games without a midcourt line, and at the first timeout, a guy ran across the court and stripped the midcourt line. That was 2013. We&apos;re a little more organized now." The Greater Raleigh Sports Alliance (GRSA) brings the event to town each year and serves as presenting sponsor. 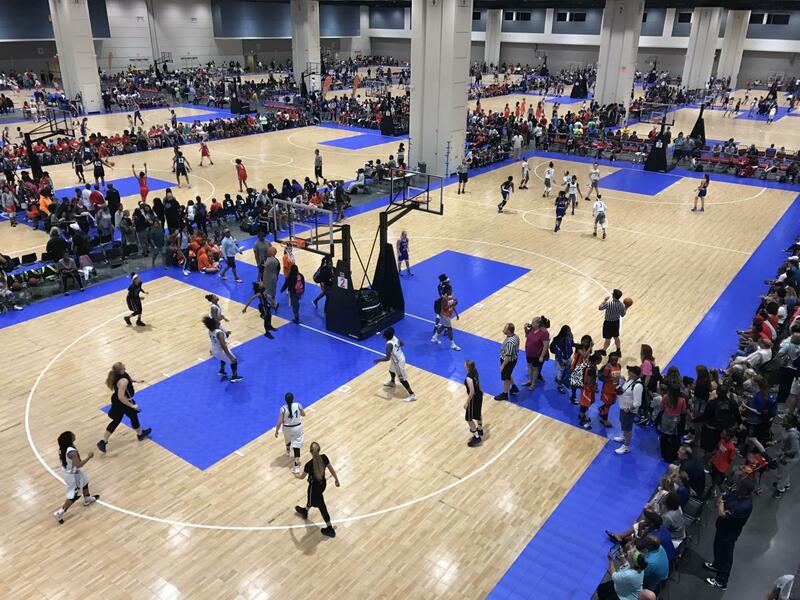 "This is one of the largest and most complex annual events on Raleigh&apos;s sports calendar, and every year I continue to be amazed at how well it is organized and run," said Scott Dupree, executive director of GRSA. The organized chaos of 40 teams having just played, 40 starting to play, and 40 more waiting is something Frank Girginis wanted his team from Basketball Development School (BDS) of Hudson, N.H., to experience. "I think it&apos;s awesome," Girginis said. "I came down three years ago, and I was in awe. It&apos;s nothing like this back home. It&apos;s an experience for the girls to see these big events." The BDS team had parents vs. players bowling at CineBowl and Grille in Cary—the parents won handily Fri. night in just one example of the tournament&apos;s estimated $2.6 million in direct visitor spending. On Sat. night, they got to experience some Raleigh hospitality: The team was invited to a cookout at the house of one player&apos;s uncle. The game that night was driveway hoops, a night the players won&apos;t soon forget in a weekend full of memories. BDS went 3-1 in its under-15 bracket, losing in Sat.&apos;s semifinals 56-49 but otherwise rolling over competition, with wins by 12, 25 and 15 points. The Transway team from Canada, which counts University of Connecticut standout Kia Nurse and WNBA player Shona Thorburn as alums, made a point to find food it didn&apos;t normally encounter. They kept breakfast and lunch simple, then filled up on hush puppies and experienced brisket at dinner. Playing games in late morning gave them time to explore college campuses after lunch. They won three of four games in the tournament. "It&apos;s fun to be down here," Transway coach Jobina D&apos;Aloisio said. "The girls are excited to see all those coaches. I&apos;d say pretty much all of them want to come down to the U.S. and play basketball." 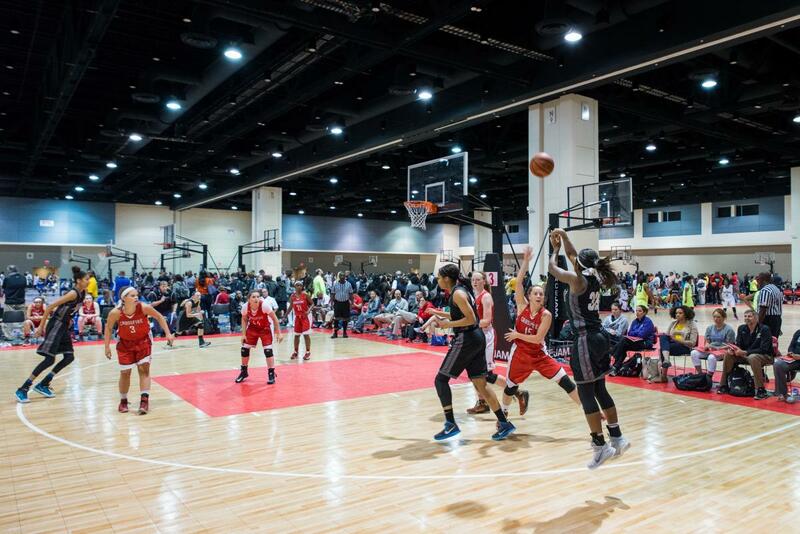 Traveling to Raleigh, and the Deep South Classic, provides the perfect launch point.